Interested in a challenging alternative to the treadmill? Consider the super-efficient Bowflex M5. This compact home fitness machine is designed to outperform treadmills in several ways. It supports full-body workouts, is zero impact and is designed for rapid calorie burn. Burn calories at up to 2.5 times the rate you achieve with a treadmill! How it works: The Max Trainer M5 offers 16 resistance levels. Your lower body trains with an elliptical or stair-stepping motion, depending on the resistance setting. Your upper body gets toned with help from moving arm bars. The bars look similar to those on elliptical trainers, but they can be nearly twice as effective at toning your body. Zero impact fitness machines like the Bowflex M5 are popular in part because they reduce the risk of injury. With an M5, but obviously not with a treadmill, your feet never leave the machine. The fluid motion is gentle on your joints. The zero impact factor also helps you exercise more vigorously than usual. This treadmill alternative is the top model in its series. It has 16 resistance levels and nine built-in workouts. The M5 can also sync with a free with free Max Trainer® App for Apple iOS and Android devices. The Bowflex M5 sells for $1,599 online with free delivery. The purchase price includes a chest strap for wireless heart rate monitoring. 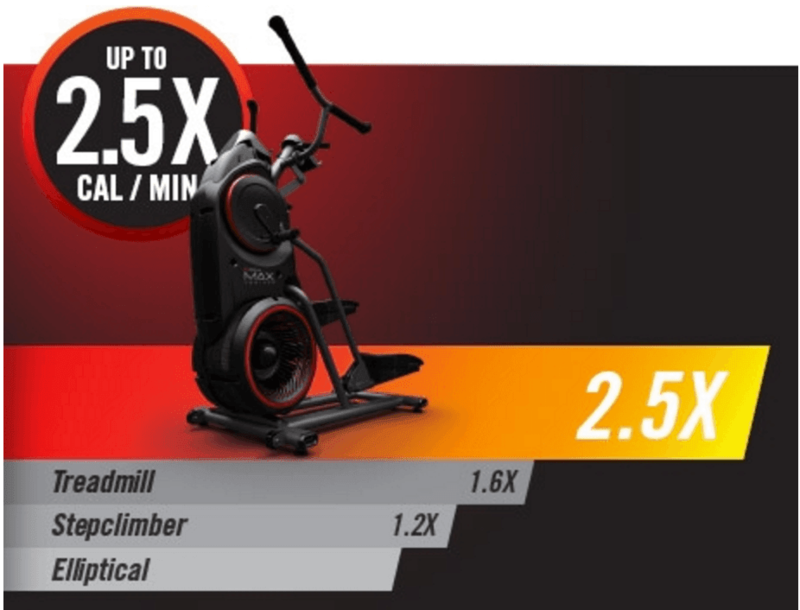 Bowflex claims the Max Trainers burn 2.5 times more calories than using an elliptical machine. Zero Impact: Unlike treadmill running, exercising with a Max Trainer is zero impact. Your body stays in constant contact with the machine instead of repeatedly hitting its surface. This can help you avoid the back pain and joint pain often associated with exercise. Higher Intensity: This perk relates to the “zero impact” point above. With many other forms of exercise, the impact shock of training detracts from your efficiency and endurance. With the M5, you aren’t “wasting” energy as your body deals with impact. This lets you exercise at a higher intensity without raising your perceived exertion level. You can get a superb full-body workout including warmup and cool-down in under 20 minutes. Upper Body Workout: Upper body motion helps explain why Max Trainers support rapid calorie burn when compared with treadmills. The moving arms on Bowflex Max Trainers are significantly more effective than those on most elliptical trainers. Resistance: The Bowflex M5 has 16 resistance levels. These levels are most appropriate for people who are already in pretty good shape. The wide range can help you avoid a fitness plateau. Preset Programs: The M5 has a backlit display giving access to manual exercise mode and eight preset workouts. The presets are: Max Interval, Smart Max Interval, Calorie Burn, Fat Burn, Calorie Goal, Stairs, Steady State and Fitness Test. Heart Rate Monitoring: A wireless chest strap is included with the sale price. You can also monitor your pulse with a contact grip system. Two User Profiles: Two trainees can save their physical stats and workout data. Extras: The Max Trainer M5 has a water bottle holder and a reading rack. The rack is large enough to hold a magazine or a tablet computer. Compact: Bowflex Max Trainers take up little space compared with treadmills. The M5’s footprint is 46? L x 25?. The machine weighs 143 pounds. Assembly: Assembly takes an hour or more. We recommend paying extra to avoid setting up this product yourself. This will save you a headache in the beginning and could also help you avoid problems down the line. Best for Already-Fit People: The lowest resistance level on the M5 is too powerful for some customers. Unlike other zero impact fitness machines, it isn’t intended for gentle rehab. Uncomfortable for Some: This trainer could be uncomfortable for small trainees. They might want the moving arm bars to be placed closer together. Price: This series of Bowflex fitness machines do not have the best combination of price and warranty. The Max Trainer M5 costs $1,599 and is under warranty for two years and the high end Max Trainer M7 costs $2,199 and has a three year warranty. With a comparably priced treadmill you could get more generous consumer protection. The Bowflex Max Trainer M5 is a powerful zero-impact trainer for intermediate to advanced athletes that are looking for a treadmill alternative. The main disadvantage of buying the M5 is its price/warranty combo. At the same time, it can be a very powerful tool for training your entire body in less time than you thought possible, so for that aspect we give it 5 stars. This unit is a bit more appealing than M3 thanks to extra programs, app integration and doubled options for resistance.